That would actually be closer to berth 1. What you see in the corner is likely the pier. That video shows the longest consist of Budd Cars that I've ever seen. Not that I've seen many though. I purchased and read a 1990s book on BC Rail, "BC Rail - BC's Great Train Adventure" by Chris Harris. 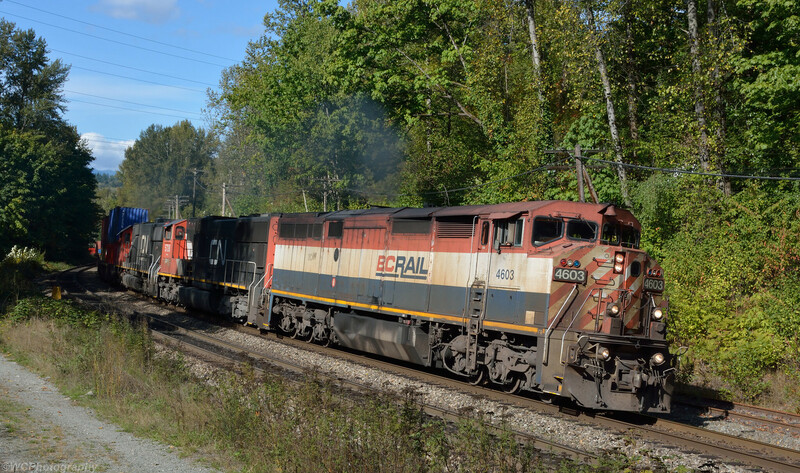 In most of the photos of the North Vancouver - Prince George passenger train "Cariboo Express," the consist is of 5 Budd cars, and sometimes as many as 7. Was a 5-car consist typical of the BC Rail passenger train for the 1980s and 1990s? Hey, I'm used to E&N Budd cars where 2 RDCs is a long train, instead of just the usual single. I purchased and red a 1990s book on BC Rail, "BC Rail - BC's Great Train Adventure" by Chris Harris. I have had a copy of that book for many years. There are very nice photos in it of the Royal Hudson excursion train & the regular all RDC passenger trains that I recall as being named the Cariboo Dayliner. Those 'trains' ranged in length from two to seven RDC's. The schedule was daily between North Vancouver & Lillooet, and three times weekly beyond Lillooet to Prince George. Trains left North Van early in the morning (~7:30 AM) with four to seven cars if going all the way through to Prince George (arrival about 9:00 PM if on time). Once at Lillooet the train was split with two cars continuing north to PG, and the remainder returning south to North Van. On the next day the train that was at PG would go south to Lillooet & link up with a short train that had come up from North Van. They would return as a long train to N. Van. The long train was, I believe, four cars in low season & as many as seven when ridership was high in the summer. 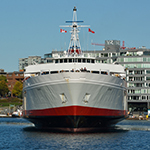 There were two classes of service with the higher class being branded as Cariboo Class. Meals were included. You were fed (as I recall) airline style meals at your seat. When I say 'airline style' I am meaning the way it used to be on the airlines where you received a half decent meal at no extra charge. 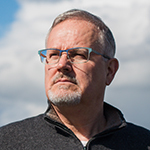 The BC Rail passenger service was cancelled very soon after Gordon Campbell got his hands on power in British Columbia. Shortly thereafter BC Rail was absorbed into CN's vast network. By the end of Budd car service, there were mainly one each of the rdc-1 and 3, with and additional rdc-1 in summer. At Lillooet they would split the rdc-3 off to continue up to Prince George. The rdc-3 would meet up at Lillooet the following day. I wasn't sure where to post this... but West Coast Railway Association (the museum in Squamish) will be returning the former itinerary of the Royal Hudson excursion to the rails for one weekend in October. It is a fundraiser to get the 2860 steaming again. In generalities it looks like this project has some momentum, and at least a somewhat realistic chance of CN permitting regular excursion operations. Time will, of course, tell. Dates October 10 & 11, 930 am boarding and 430 pm return. Lunch and museum admission are included in Squamish. It is a buffet style lunch, I hope they're prepared. Remember it is a fundraising excursion, hence the high cost. I will be riding the rails for this one! 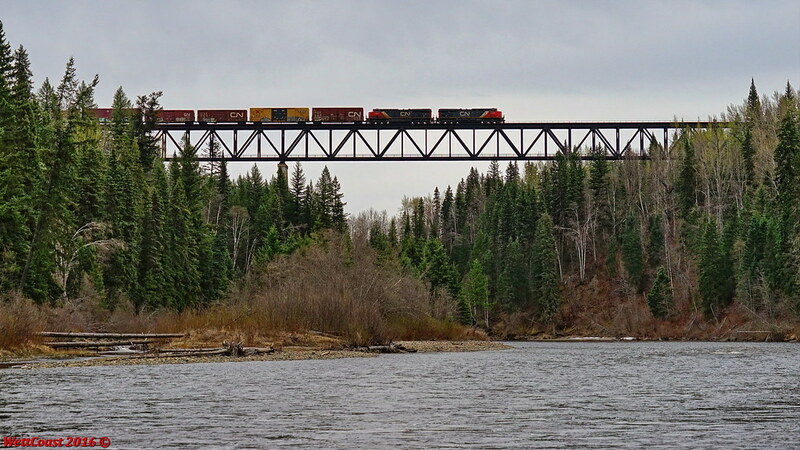 CN #'s 2975 & 2860 lead south bound freight over the Cottonwood River bridge on CN (ex BCR) Prince George Subdivision north of Quesnel, BC - 16 April 2016. Note the two rather foolish individuals (right side of photo) who were in the middle of this bridge when this train blew its whistle on approach from the north. This train had to stop on the bridge to avoid a rather nasty 'accident'. I'm surprised I missed that RDC chat from much earlier. I'm a big RDC fan and was an avid follower of the last few years of passengers services. The longest BC Rail RDC train was nine cars, which is recorded as happening twice (not to say it happened only twice). That was in the early nineties when the fleet size hit its peak. There was a mention of a single RDC3 going to Prince George; this wouldn't have been common at least in the last decade of service. Two cars were essentially always used; nothing to do with passenger count but rather reliability of the Budds to ensure if one died they could still clear the main. Generally in the winter trains were two cars per section, for a total of four cars on consolidated trains (one half ran daily N Van to Lillooet - one half ran one direction to / from Prince George three times weekly, for six one way trips in a week). In the summer the Lillooet portion of the train generally had a third car. In the second to last and last summers six car trains became common again as the Whistler Explorer schedule changed to allow the run to be consolidated with the Northbound Cariboo Prospector to save money. That same car would then come southbound with the Cariboo into North Van for fueling and other servicing. The maintenance budget for the cars was slashed well before the end of service, and BC Rail staff of the time must be commended for keeping some Budds running. Half the fleet was unserviceable at the end, and it was apparently a real effort just to keep the four cars running to maintain the minimum service level. BC11, a car on the last train, was actually pulled from storage because three RDC1 las had been removed from service in relatively quick succession. BCOL 4622 has been appearing on the daily transfer CN runs between it's yards at Port Mann and Lynn Creek for the last couple weeks. 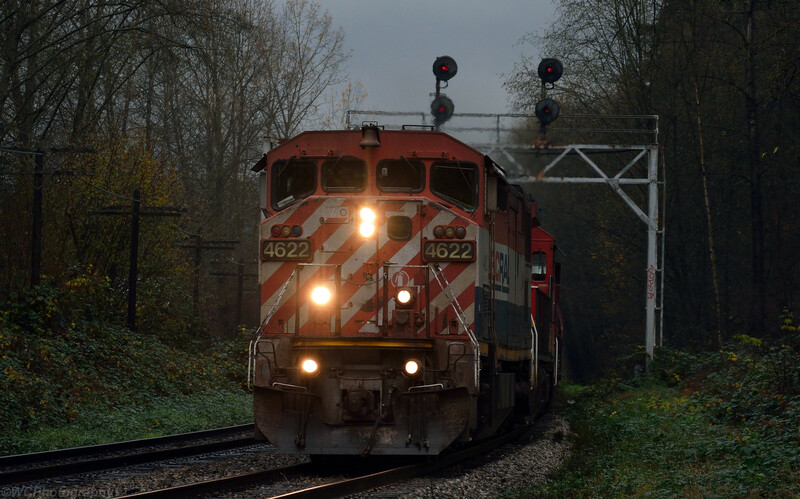 Here it leads the morning northbound run at Piper, on CN's (former BNSF) New Westminster Sub. I'm not sure if I'm posting in the right thread, as I don't know very much about the BC rail industries. Which is why i'm asking though! I regularly walk my dog in eastern end of the Burnaby Fraser Foreshore park near the incinerator. There's a rail line that runs through the park and crosses the river via one of those rotating bridges into Richmond. I regularly see trains that are a few dozen cars long coming from the Richmond side over the bridge (from where in Richmond, I have no idea, though I am curious) and heading, presumably through New Westminster to somewhere. Another spur from this line runs straight through the southern end of Burnaby and then parallels Kent St. in Vancouver, has several spurs for industrial access and eventually runs up the old Arbutus corridor, though I believe they've removed that part of the tracks recently. I have driven Kent st. between Knight and Cambie quite regularly for the last 3 years, and worked in an office on near Kent/Knight for several months last summer and have NEVER seen or heard a train run along those tracks. But earlier this evening, only a couple of hours ago, I was walking my dog towards the east end of the Fraser Foreshore park, and saw a train, albeit a small one (2 locomotives and 2 cars) running on those tracks, heading west into Vancouver. I saw the train while I was walking through a new pedestrian path in the new developments just west of the Boundary/Marine intersection. I had no means of following it to see how far it went. Can anyone provide any insight on how often these tracks are used, and what gets moved along there/who uses them? Is there another connection to Richmond further west or is this a dead end? Google maps shows another rotating bridge near Oak St but some of the images make it look like it has been removed. question is one of those more micro-local situations that are fun to get the full story about. Let's get our real 'railbirds' working on this one and fill in the historical bits and pieces a.s.a.p. The railway bridge you referred to near Oak is the Marpole bridge, and it's on the cover of the October Western Mariner. 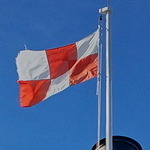 It is no longer in use, and has been partly dismantled. If this the east end of Richmond, it is CN. The old BC Hydro Railway used to cross right by the Oak Street bridge, and is now defunct. 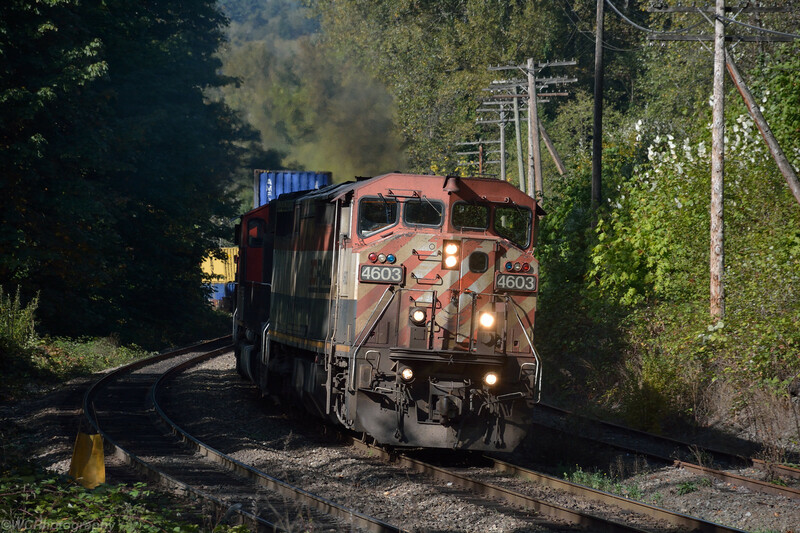 CP usually sends trains out to the yard at the foot of Cambie Street twice a week. I believe on Wednesdays and Sundays. they switch the few remaining customers before returning east to Port Coquitlam. Before the bridge was dismantled, they would also continue across to Richmond to serve the Univar chemical plant on Wednesdays. Sadly I never got photos of that part of the operation.